On Monday evening, members of the Knesset visited Amona to provide support in light of pressure to expel the residents. Amona, famous for the violent expulsion carried out by the police after the withdrawal from Gaza, has become a symbol for the settlement movement. 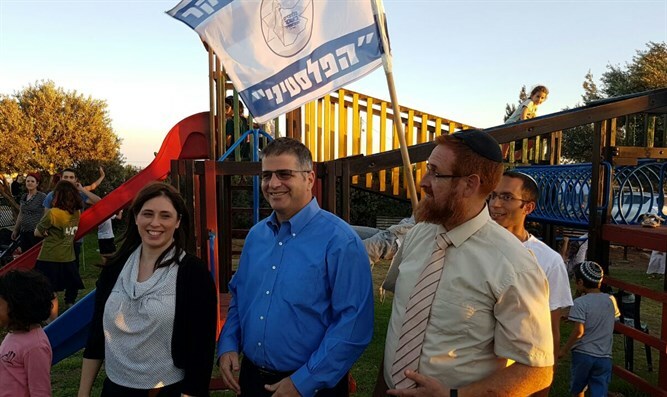 Tonight (Monday) three members of the Likud faction made a solidarity visit to Amona and spoke with the residents. Yoav Kish (a Likud MK) emphasized that the first law he presented was the "Regulation Act," intended to legalize Amona retroactively. Kish complained that the only reason his law had not been adopted was that the Attorney General opposed it. In Kish's opinion, after the failure in Netiv Avot (a neighborhood in Gush Etzion also slated to demolished after a Supreme Court decision, ed. ), and the regulation order failed as well, the "Regulation Act" is the only solution. However, deputy Foreign Minister Tzipi Hotovely stressed that the Prime Minister should not be held culpable. "A man who distributed a video comparing the Palestinian desire for a 'Judenrein' state to ethnic cleansing is not someone who wants to uproot communities. It does not serve us to aim at him," she said. According to Hotovely, "We are talking about something that can be solved legally and can be brought to the Ministers' Committee. There is no legal barrier to passing [this law], anyone who says otherwise is lying. The law of Azrieli mall (in Tel Aviv, ed.) is the same as the law of Amona." Yehuda Glick, an American-born Likud MK known for his Temple Mount activism, stated, "We as members of the Knesset are no less concerned about the inhabitants of Amona. I stand here saddened, because this brings me back to the period of the Ulpana Neighborhood (in Beit El, ed), and in the end, it was destroyed." "We are forbidden to be complacent, but rather, we must act. The objective is not just to prevent destruction, but rather to build. We call on the Prime Minister to not just talk about ethnic cleansing, but also about construction and extending sovereignty to Judea and Samaria. Also to the left, it is clear that there is no such thing as sovereignty. The Regulation Act must pass in the next sitting. We cannot allow ourselves to get into a difficult situation, even if, Heaven forbid, there should be a decision to evacuate. The law of Amona is like that of Ulpana. For every building they destroy, we will build ten," Glick said. The head of the regional council for Judea and Samaria expressed the sensation that they were going in circles. "Amona and Ofra are not the only villages under discussion, he said. "We're talking about 3 thousand homes. It has come time to tell the Prime Minister, 'Stop!'" Most of the anti-Jewish activities that have occurred in Judea and Samaria are a direct result of Arab pressure on the international community.